Mother’s Day is a little over a week away, but I wanted to have a Mother’s Day blog hop today in order to give plenty of time for menu planning and inspiration. Back home Mother’s Day is usually one of my favorite days of the year. Usually my mom, sister, and I use it as an excuse for a girls’ day out. We go to the zoo or botanic gardens, get mani-pedis or enjoy a leisurely brunch, stroll through a museum or go shopping (and yes, we’ve done all of those things on Mother’s Days past). Living so far from home I have to wait until summertime to enjoy those days with my family, but on Mother’s Day I’ll be thinking about my momma nonetheless. Have I mentioned that she’s the coolest? She has an educational blog of her own and has co-authored a book for teachers that will be out in August. Talk about an amazing role model. I’ve already shared my recipe for Hollandaise Sauce, so the rest of the recipe is fairly simple. Don’t be afraid of poaching eggs – it’s really quite simple once you get the hang of it! I used to use a drop of vinegar in the water, but have stopped since I find I make perfectly good poached eggs without it. The most important things I have learned is to keep the water shallow, just deep enough to cover the egg completely, and to make sure the water is lightly simmering but not boiling. Serving Eggs Benedict with smoked salmon instead of the traditional Canadian bacon makes it an even more special dish, sometimes called Eggs Norwegian. Here the typical English muffin base is replaced with baked puff pastry circles. Although you wouldn’t expect such a small change to make a difference, the rich, flaky puff pastry transforms this into an even more decadent and celebratory meal. Unroll the puff pastry (it should be about1/4-inch thick). Using a cookie cutter or large glass, cut out 8 (4-inch) circles. If you don’t have room for all 8 circles at once, roll up the extra puff pastry scraps in a ball and roll out to ¼-inch thick and cut out the remaining circles. Transfer the pastry circles to the prepared baking sheet. Put in the oven and bake for 10 to 15 minutes, until puffed up and golden brown. Remove from the oven and set aside. Meanwhile, poach the eggs. Fill a small pot or shallow pan with 3 inches or so of water. Heat over medium heat until just simmering (not boiling). From just above the surface, crack an egg into the water (you can cook multiple at a time depending on the size of your pot or pan). Poach for about 3 minutes, or until the eggs are set. Using a slotted spoon, remove the eggs from the water and drain on a paper towel-lined plate. Repeat with the remaining eggs. Put two puff pastry disks on each of four plates. Top with smoked salmon, then one poached egg per disk. Drizzle hollandaise sauce over and garnish with chopped parsley or chives. Serve immediately. Kosher dairy Vegetarians can replace smoked salmon with sautéed spinach for a tasty rendition of Eggs Florentine. Love a good injection of shameless self promotion ;). I adore brunch and it is the perfect Mother’s Day meal. Wish I was closer to mum this time of year too but I’ll just cook on my blog for her instead! ooooh lovely recipe and using puff pastry…. you are the puff pastry Queen…… Happy Mothers Day to you ! If I could pick any breakfast in the world for my mother’s day, THIS would be it. I simply adore smoked salmon! I love eggs benedict and your are simply gorgeous! I have never made them though and I’m ashamed of it. I like your puff pastry version. It must be flaky and crunchy and irresistible. We made these on Easter and they were so delicious. Jack has already asked me to make them for father’s day, but I’ll no doubt be making them again before that! Smoked salmon is my absolute favorite way to eat Benedict! I linked up my honey cloud pancake because it is super easy to make. Which is a good thing because if anyone’s making Mother’s Day breakfast for me, it’s me! Katherine..I made a similar eggs benedict, except with a saffron-dill Hollandaise, back in ’09. I only wish I busted open the egg for the photo, though. Yours look gorgeous – beautiful photos as always! Great bloghop theme! These look great, but I’m going to bookmark this recipe for Father’s Day instead since my dad is a huge lover of eggs benedict! Such a wonderful theme for today’s blog hop! I am sure most people who cook, must have had their first lesson from their mothers, so this day is all the more special for food bloggers 🙂 I learnt everything from my mom. She started really early and dropped hints every now and then and I never realized that I knew so much about food. So today, I am sharing one of her best recipes with you – Mixed vegetable kurma! You’ve got to try this recipe to know what I am talking about 🙂 Happy Mother’s day!! Oh I better get on my Mother’s Day recipes. I made this quiche for my Easter post, but would be perfect for a MD brunch too! oh yumm! wish I coudlt make those for my mum, she would love them. Your ebook is awesome Katherine. I recommend it to anyone, totaly worth it! What a beautiful dish! Now I just have to sneak this recipe onto my Hubby’s desk 🙂 Thank you for sharing, Katherine! I’ve never seen this recipe with puff pastry before but I think it works. Excellent choice! 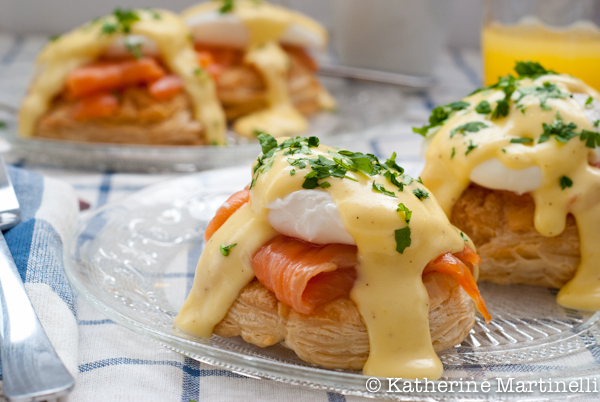 Mmmmmm….I would love if my kids would make me your smoked salmon eggs benedict! I’ve been eying this yummy recipe since I first saw your cookbook…it’s fabulous!!! Brunch is such a perfect Mother’s Day meal and anything with pastry makes us happy! I love your blog hops and for this one, I’ve included a lighter version of little individual goat cheese tarts that get big raves in my family. A smoked salmon benedict sounds absolutely decadent! The perfect way to spoil mom on mother’s day! Moms are the coolest 🙂 This is a beautiful eggs benedict. The salmon is stunning! I never would have mixed up the traditional benedict like this, well done! This is fantastic. I do not have access to a great deal of seafood, however, salmon I can get my hands on. I do love eggs benedict, but I have never made it myself. However, by the looks of this, I do need to make this. A great way to make an ordinary day a little bit more special. Enjoy the weekend.! I have to admit that I’ve never had eggs benedict before. I must try your recipe as this was the cover of your beautiful blog! Such a gorgeous shot! What a delicious take on eggs benedict. Your photos make me want to dig right in. Congrats on the top 9 ! These look delicious. I really like the idea of using puff pastry. Congratulations on Top9! I am honored to be featured in the same group, with you! Wow Katherine this looks beautiful and what a lovely presentation. Congratulations to you on the Top 9. Hoep you are having a fantastic day. Congratulations on making the foodbuzz Top 9! I have never been able to poach an egg without vinegar and have it not fall apart. Good job! I don’t think Eggs Benedict can get better than this! What a lucky momma to get this for brunch! Great blog hop idea! 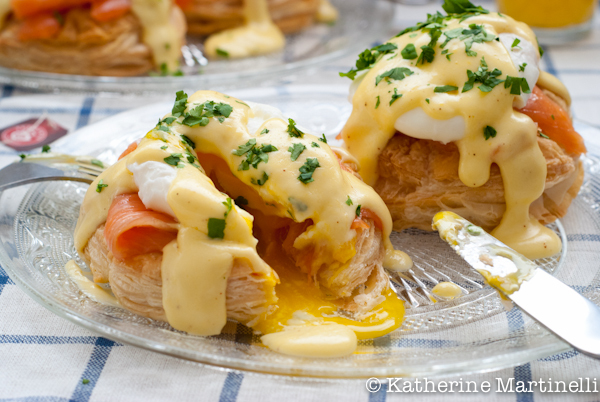 Very nice Katherine, I love the use of puff pastry and salmon in this eggs benedict breakfast. Oh I think I can wow my Mother and Mother in-law at brunch this weekend if I did this! Looks sooooo good!! Terrific food styling on these photos! Really, really good. And a nice post all around. Salmon is a nice change in Eggs Benedict – good choice. And I agree with you on the vinegar – it’s really not necessary, although it’s a nice “feel good” crutch. Good post – thanks. In Scandinavian countries they eat a lot of salmon even in breakfast. I love the additon of it in your eggs Benedict. It gives a very elegant tone to the dish. Mom as my grandmother used to say is the golden blanket for the child! I love anything with smoked salmon – that is a beautiful dish and would make a great Mother’s Day Brunch for sure! I am very jealous of those who got to eat this dish. Wow, this looks amazing. Thank you for sharing. I will definitely need to try this one out. The photos alone make my mouth water.